Kingdon trap (1923): A cylindrical cathode wire is placed on the axis of a cylindrical anode shell of much larger radius, thereby forming a logarithmic field (much like the cylindrical capacitor or Cylindrical Mirror Analyzer (CMA)). This traps positively charged particles having an angular momentum around the wire. Trapping the axial direction can also be obtained by end caps at positive potential. Knight trap (1981) (“ideal Kingdon trap”): This has a radial logarithmic potential, like the Kingdon trap, but it also has an axial quadrupole potential (so-called “quadrologarithmic”) formed by a rounded outer electrode. orbitrap (2000): the field is quadrologarithmic like the Knight trap but, for example, both electrodes are shaped to form a more ideal quadrologarithmic field. Like the Penning Trap (ICR), image current detection can be involved. Fig. 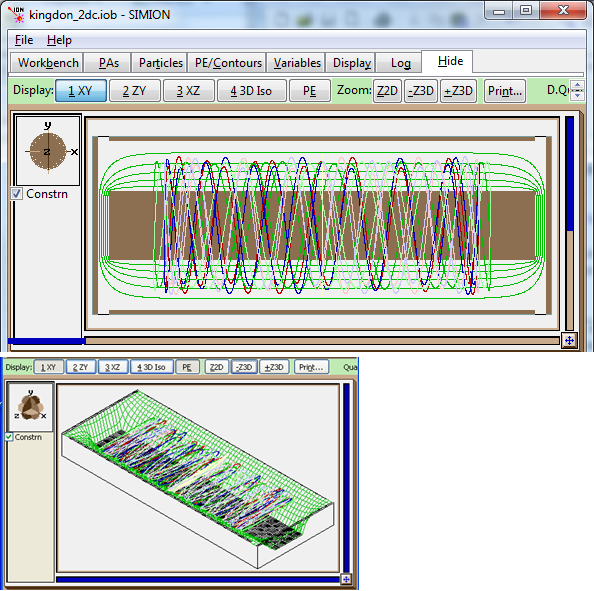 46 Figure: Kingdon and quadro-logarithmic field (orbitrap-style) electrostatic traps. See SIMION Example: kingdon (8.1.1.0). Makarov2010. Makarov, Alexander. “Theory and Practice of the Orbitrap Mass Analyzer.” year 2010, pp. 251-272, doi:10.1201/9781420083729-c3. MassSpecPro: Orbitrap - tutorials with SIMION videos on orbitrap theory. PerryCooks2008. Perry, Richard H.; Cooks, R. Graham; Noll, Robert J. “Orbitrap mass spectrometry: Instrumentation, ion motion and applications.” Mass Spectrometry Reviews. volume 27, issue 6, year 2008, pp. 661-699. doi:10.1002/mas.20186 (highly cited) (SIMION orbitrap simulations). Others: link2. 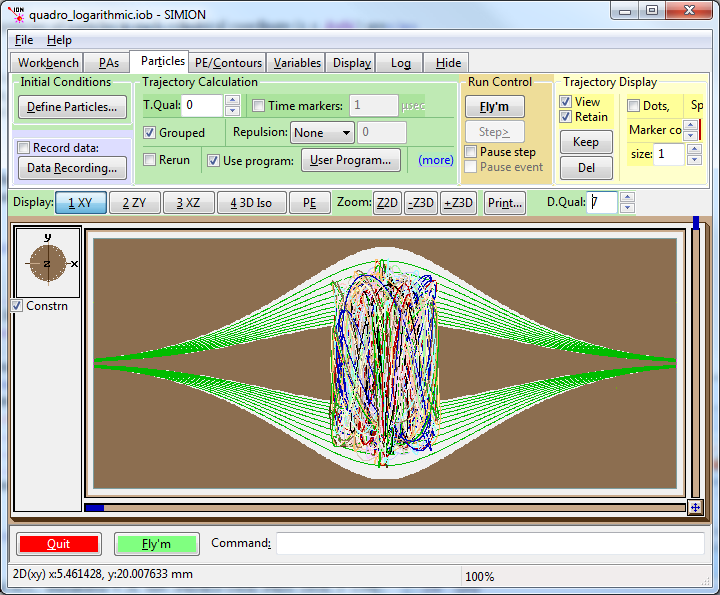 “Simion 8.0 simulations of electrostatic trap.” Suits group, chem.wayne.edu. (accessed 2012-03) link.